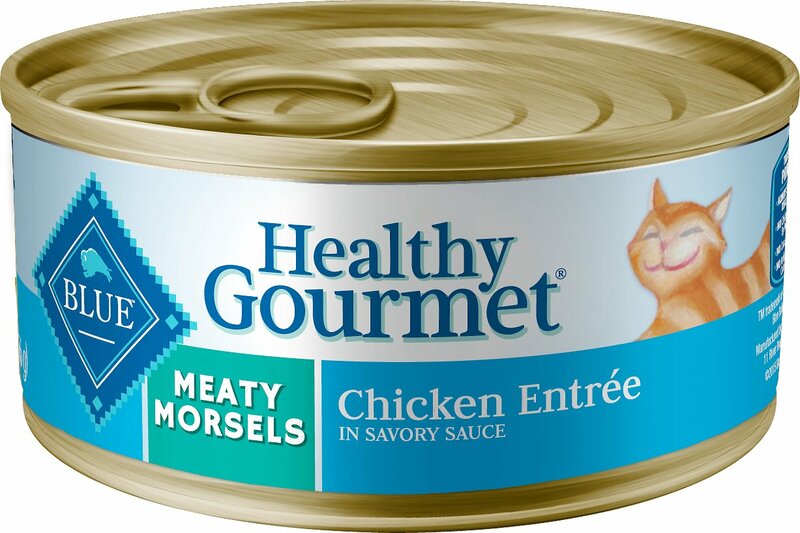 Feed your kitty’s wild side with the gourmet nutrition of the Blue Buffalo Healthy Gourmet Meaty Morsels Chicken Entree Canned Cat Food. Made with real chicken as the first ingredient, it packs a powerful protein punch to support your little hunter’s wild pursuits and satisfy his cravings for meat in every bowl. It’s loaded with vitamins, minerals and taurine to help maintain overall health, and naturally-sourced omegas to nourish a healthy skin and lustrous coat. Plus, since it’s made with real broth, it helps keep your pal hydrated to support digestive and urinary health. 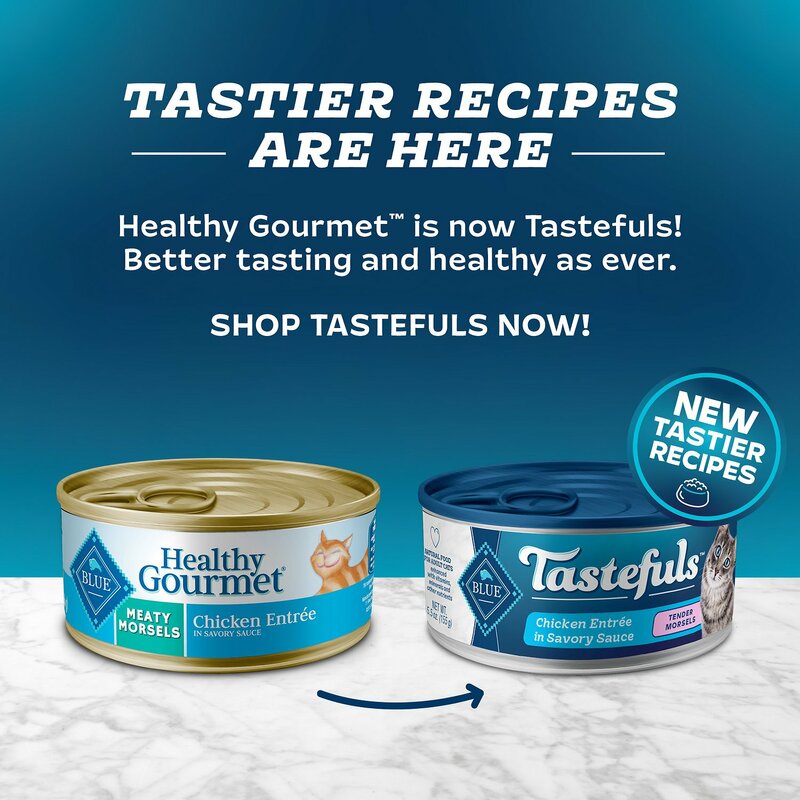 Serve up as a complete meal or delicious kibble topper and watch your feline foodie lick his whiskers with every bite. Gourmet recipe starts with protein-rich chicken as the first ingredient to support strong muscles and healthy energy. Loaded with garden-grown veggies, cranberries and wholesome brown rice, plus vitamins, minerals and essential taurine for overall health. Provides tasty moisture made from real broth to keep your kitty hydrated and support urinary health. Made in the USA with zero by-product meals, corn, wheat, or soy so it’s great for kitties with food sensitivities or allergies. 3 oz Can: Feed 3 cans per 6 - 8 lbs body weight per day. 5.5 oz Can: Feed 1 1/2 cans per 6 - 8 lbs of body weight per day. BLUE Healthy Gourmet for Cats always features high-quality real meat, healthy fruits and wholesome whole grains. Like all BLUE foods, it's made from the finest natural ingredients enhanced with vitamins and minerals. With flavors and recipes inspired by wholesome, homestyle cooking, you'll find a large variety of wonderful wet foods all formulated to support your cat's health and well-being through every life stage, no matter his size. Plus, Healthy Gourmet Kitten formula contains DHA, an essential fatty acid found in mother's milk, to help promote cognitive development, and the right balance of calcium, phosphorus and essential vitamins to promote healthy bone growth. My older cat just didn't like this as she prefers pate. This is tiny morsels so I thought she would eat it but we had to dump her bowl. Another cat may like it though. Sometimes our other cat, who prefers non gravy shredded, will eat it but not all at once. We always have to go back to a particular brand of pate to get our older cat to enjoy her can of food. Kitties approve it after a few tries. It looks processed, but won't complain, since they are eating it, unlike a bunch of other foods I bought to try to entice them. They both have kidney disease, so I will take what I can. 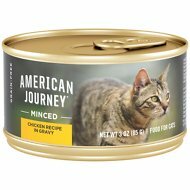 I purchased a case of this food because my cats seemed to like it when I purchased one can for them. Unfortunately they didn’t like it. I know it has good ingredients but they just wouldn’t eat it. They love Blue hard food but this they turned their noses up at it. I donated it to our local animal shelter. I gave it three stars because of the quality ingredients but obviously it must be seasoned not to appeal to my cats. 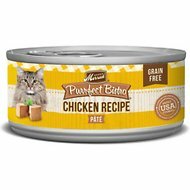 My cats love this food. I switched a couple of months ago from Friskies. Vomiting incidents have been reduced by at least 2/3. We are all happy. Have been using Blue Buffalo Freedom for indoor cats. Have added this to their diet every morning. They really love it. (You never know with cats, right?) This is now part of my autoship delivery every 3 weeks. Everybody in my house is happy! Thank you, Chewy. I didn't think my cat would eat it. I wanted to start her on it because there's no grain, only wholesome chicken. She loves it. I just wish the can wasn't so big. My cat lost his lower lip some time ago and has found it difficult to eat softer canned foods. And most of the other brands we tried smell awful to me feeding him and he wasn't that crazy about them to eat. Tried the Blue Healthy Gourmet meaty morsels Chicken and now we are all happy!! Great service for less money. Cats love the food. I have an older cat , she needs hi protein. My cats like this food and they are growing older. They can be very picky. So far, they eat every bite.